Several Russian cities and regions have announced they are implementing the Smart City concept. 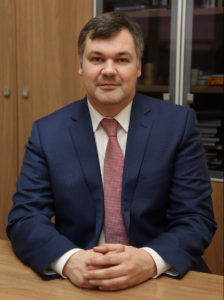 Nizhny Novgorod Region Minister of Information Technologies and Communications Sergei Yefimov has spoken about new initiatives in the sphere implemented in the region. − How has the work proceeded on the development of the Smart City concept in the Nizhny Novgorod Region? − The development of the regional concept and its implementation roadmap is extensive work that was conducted over several months and involved the international IT cluster of the Nizhny Novgorod Region. In accordance with the documents, a total of 125 projects will be implemented under the concept from 2018 through 2023. In particular, the roadmap implies the measures in the housing and utilities sector, transport, healthcare, education, tourism, environment, and urban development, as well as digitization of the authorities’ work and state services. In the spring of 2018, by the decision of the Russian Ministry of Construction, Housing and Utilities, Nizhny Novgorod and Sarov were included on the list of 25 pilot cities to implement the Smart City project, which was initiated as one of the areas of the country’s digitization. In July 2018, Nizhny Novgorod hosted a meeting on the development of digital economy, chaired by Deputy Prime Minister Maxim Akimov. In late August 2018, the Russian Ministry of Digital Development, Communications and Mass Media held a meeting, Digital Transformation of the Regions, with heads of federal and regional executive bodies responsible for the digital development, in the town of Dzerzhinsk. Following the meeting, a draft summary of the regional program of the regional economy’s digital development was drawn up and forwarded to the Ministry of Digital Development, Communications and Mass Media for consideration. The program is scheduled for 2019-2024 and, along with basic areas such as statutory regulation of the digital environment, information infrastructure, personnel for the digital economy sector, and digital governance, also includes the areas aimed at transformation of priority sectors of the economy and social sector: digital industry, trade and logistics; digital agriculture; digital tourism; digital healthcare; digital education. − What are your goals and tasks? − Our main goal is to make the region reach a new technological level and to secure a smooth digital development of the whole region, not only large cities. We see Smart City/Smart Region as priority concepts because the projects implemented in this area are directly related to local residents’ demands. This is not digitization for the sake of it; these are the efforts to make our cities more comfortable to live in. As regards our tasks, they primarily include providing security of the residents and increasing the quality of managing regional and municipal resources such as transport and property. Also, we plan to modernize the housing and utility sector, including resource supplies, introduce efficient mechanisms for territorial planning of the urban environment improvement and the related infrastructure, introduce intelligent transport systems, and secure a new level of monitoring the region’s environmental situation. − What investments and other resources are you plan to attract? − Under the project, we will sign investment agreements and concession agreements with private companies and units of state corporations. Nizhny Novgorod has already signed a concession agreement with the Volga interregional branch of Rostelecom for the installation of 334 smart bus stops in Nizhny Novgorod. In August 2018, the company launched a network of LoRaWAN standard base stations in Nizhniy Novgorod to provide Internet of Things services. We are certainly counting on federal co-financing under the Digital Economy national program, which includes the Smart City part. The draft passport of Nizhny Novgorod’s regional digital economy program also provides for a 4% and 96% co-financing arrangement by regional and federal authorities, respectively. − Will local, Russian and/or international IT-companies be involved? How will the Ankudinovka high-tech industrial park potential be employed? − We have signed agreements with Rostelecom, ER-Telecom Holding, and Cisco Solutions. Specific agreements, not framework ones. Several strategic meetings have been held at Ankudinovka; the Nizhny Novgorod Region Government met with residents of the Ankudinovka business incubator, the Nizhny Novgorod International IT Cluster, representatives of Rostelecom national operator, Rosatom State Corporation’s engineering division Atomstroyexport, Intel international corporation, HARMAN International Industries and other entities to work out the framework concept and identify the Smart City KPI. We also plan to attract representatives of innovative companies that are part of the Ankudinovka high-tech industrial park and the IT cluster; we expect them to offer high-quality products that will help achieve the objectives of the regional Smart City concept. − Is there enough personnel for implementing the concept? Will employees of government bodies and municipal companies require additional training? − Currently, there are over 700 IT companies in the region and some 20,000 IT specialists. But, of course, the Nizhny Novgorod and the country in general has a shortage of highly qualified IT professionals. According to the Nizhny Novgorod Development Strategy, the region will be working on projects to increase the workforce potential in IT and provide the industry with sufficient number of professionals. We have established constructive relations with local universities. We maintain a continuous dialogue with them. Through our joint efforts and with participation of IT companies we must resolve this issue. Taking into account the scale of digital transformation, additional training is absolutely necessary. Moreover, the training process must continue throughout the operations at government agencies. Government and municipal employees will by all means undertake required training.